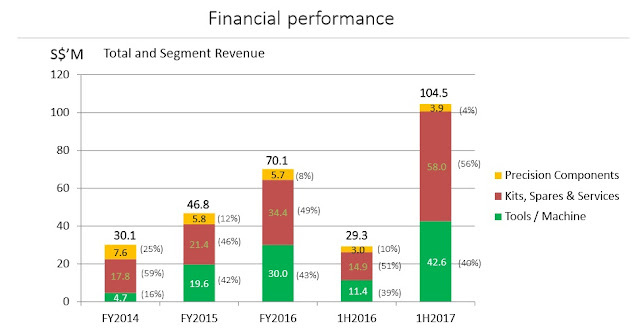 FY2018 Operating Profit remains steadily at $206.3 million as compare FY2017 of $205.4 million. Investment income boosted to $115.2 million due to divestment from Treasury & Investment Portfolio,a huge increase of $61.3 million as compare FY2017. FY2018 net profit at $281.1 million, a drop of $68.9 million as compare FY2017 of $350 million. However, there is a one off gain FY2017 due to divestment gain of $149.6 million. 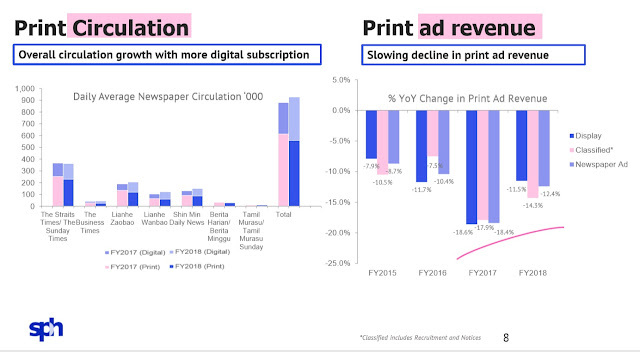 Net profit FY2018 marginally better than FY2017 if exclude divestment gain. Based on Business Times news, the UK investment expected earnings accretive at least 6.3% which is approx. $20 million per annum based on $321 million acquisition price. However Investment income is a variable income ,its income vary drastically so SPH have to keeps on divest its T&I portfolio & redeploy the capital to higher yielding asset to maintain this kind of income level which is more likely into the Student Accommodation & Health care assets. Moving forward, i expect to see more acquisition in Student Accommodation & Healthcare asset. 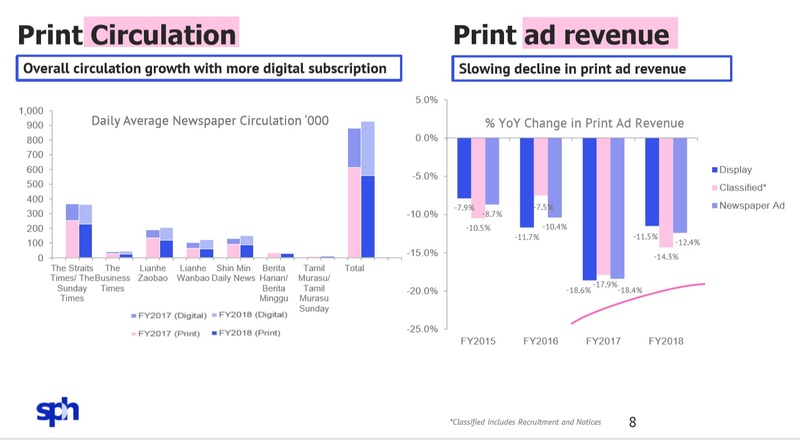 On the Media front, Digital revenue now comprise of 15% of the total media revenue & is growing but I don't expect much room for further growth but at least if it can maintain its current print/digital circulation is already a feat. For aged care business ,it is a good defensive sector but it depends how SPH going to execute its business plans to bring it further to next level of growth as SPH intend to expand it's aged care business to overseas. For education business, I don't see much potential in Han Language center but for Mind champs, SPH should divest it partially for a gain when the time is ripe. 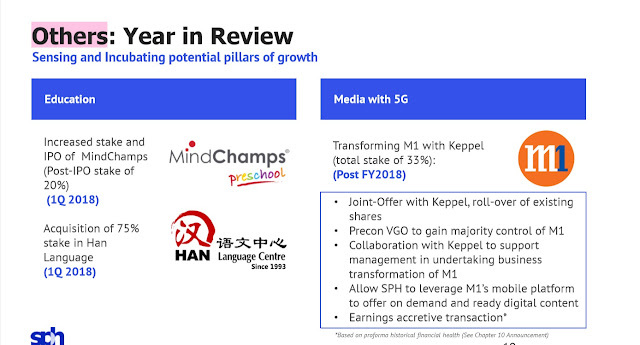 FY2019 will be a exciting year for SPH property business as its Woodleigh project will be completed & other acquisition pipelines that will take place too. 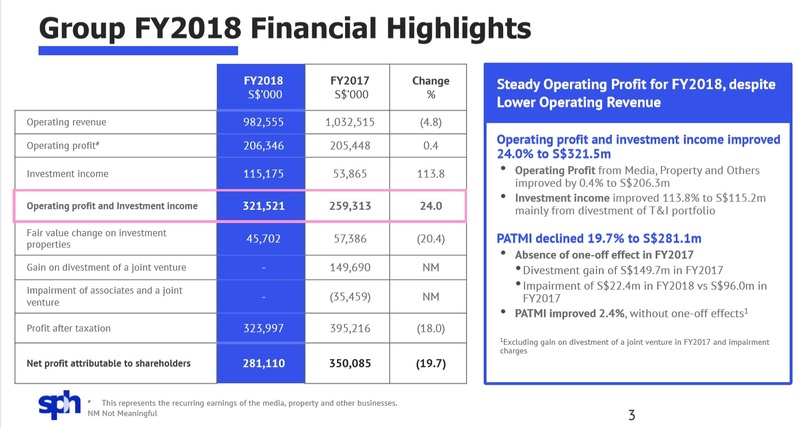 Naturally I am disappointed due to a cut in the dividends from $0.09 to $0.07 means I will see a reduction of $1600 in dividends FY2018.This year SPH AGM I expect to see fireworks going on. But Life still goes on, 2019 will be a reckoning year for SPH.